I finished my competitive swimming career just a few months shy of my college graduation. At the time, I was already aware that I’d learned so many invaluable lessons from swimming. It was through starting my working life as a young adult that I saw just how many of the lessons from my swimming career transfer over to my professional career. 10) Swimming teaches you to show up on time. I am always shocked when people say, “I was late because my alarm didn’t go off!” As anyone who has ever swum a morning practice knows, a call from your coach when you’re late to practice is so much worse than your 5:15 alarm. 6:00 practice means you’re in the water at 6:00, and this punctuality prepares you very well for the working world. 9) You learn to work with all different types of people. 8) You are detail-oriented but can see the bigger picture, too. 7) You know how to take criticism. A swim coach’s job is to help the swimmer improve. No doubt your coach has critiqued you, and sometimes, it isn’t easy to hear. Just like when your boss coaches you on ways to improve, you know they simply want to help you be better. 6) Time management has always been the key to your life. Most swimmers I know were never just swimmers. We were full-time students and members or even leaders of several on-campus clubs and groups. With morning and evening practice and weightlifting in between, managing your time well is the only way swimmers know to live. This will serve you immensely well in your career. 5) You’re a team player. That feeling when someone doesn’t show up for the relay is not fun to experience. Swim teammates are family. We support each other and help build each other up. Your professional life isn’t only about you. It’s about the strength of your whole team, a concept that swimmers already understand completely. 4) You’ve learned how to win—and lose—with grace. There will always be someone who’s a better backstroker than you. Similarly, there will always be someone gives a better interview or presentation than you. Instead of holding a grudge, swimming teaches you to view this as a way to improve. 3) You know when to have fun and when to be serious. A happy swimmer knows how to goof off with their team and have fun at a meet. But the second they get up on the block, it’s go time. Chatting with co-workers is fun, but when you go into that meeting, you can switch to state meet-level focus. 2) You know how to be healthy and de-stress. Fear is a cold going around the week before the championship meet. Swimmers know how to keep their bodies fit and healthy. They also know that to de-stress, all they need is a good swim. When your body is healthy, your mind is healthy, helping you bring your A-game to the workday. You got up early and stayed late at practice. You gave up countless weekends to meets. You practiced flip turns until you got dizzy. You cheered until you lost your voice. You believed after each and every race that you knew you could go faster. And you did. Attack your career with that same level of dedication and everything will go swimmingly. Claire Forrest is a recent graduate of Grinnell College with a degree in English. 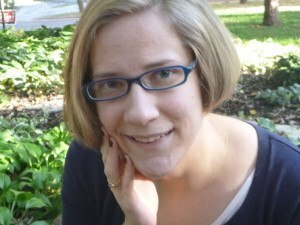 She is currently based in Minneapolis, Minnesota as a freelance writer. The only competitive swimmer in her family, Claire went to her first swim meet at the age of eleven on a whim without even knowing what a swim cap was. She fell in love with the sport and never looked back. A S6 classified disabled swimmer for US Paralympics, Claire specialized in mid-distance freestyle and backstroke and made national and world rankings throughout her career. She was a 2008 and 2012 Paralympic Trials participant. Claire is passionate about integrating disability swimming into the larger swim community, having swum for able-bodied club teams and her college’s DIII team. She enjoyed both Paralympic and prominent integrated able-bodied meets equally for the many commonalities they share. Over 13 years after her first meet, she’s happy to report she now owns more swim caps than she can count. All so true as an outside parent observer!! Haiti Swimming would be delighted to communicate with Claire Forrest to discuss about integrating disability swimming in Haiti. Please, respond through my private email. Thanks! yup yup yup and more yup. Totally agree that there are companies that are doing it well. Certainly. But there are also a lot that are not. “Silent feedback” is a real thing, and it is not isolated to just a few bad companies. I don’t know about that, In Track and Field I see few whites dominate the sprinting events at least at the elite level. There are many Asian swimmers, Asians are only 5 to 6 percent of the US population, Its just Afro-Americans and Latinos are underrepresented, So Cal high swimming is about 25 percent Asian from what I see. I mean at the high school level So Cal swimming is about 25 percent Asian. Latinos are really underrepresented since they are about 50 percent of the high school population in Southern California.